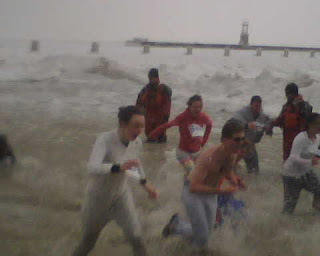 Chicago winters breed hardy souls and they were out en mass for the 2009 Polar Plunge to benefit Special Olympics Chicago and Special Children's Charities. 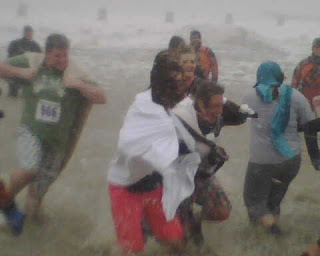 As temperatures hovered in the low teens and gusts of snow blew sideways, over 1,500 people donned everything from bikini's to winter coats to take the plunge into the icy waters of Lake Michigan. 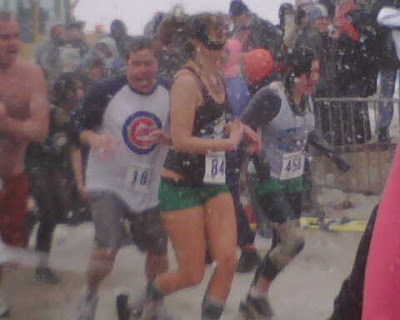 Windy City Rollers Derby Girls could still outpace Cubs fans in a snowstorm any day. Police and Fire dive teams were on hand in dry suits. The entrants were more colorfully, but less warmly dressed. Drownings weren't a big risk in the shallow water, but all rescue workers were trained in treatments for hypothermia and possible heart attacks. 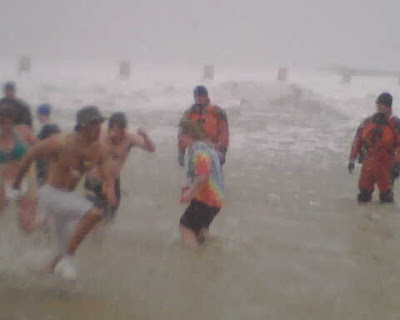 To prepare for The Polar Plunge, rescue teams practiced relay maneuvers to carry a victim from the water to an ambulance. Four men would take the board at a time and swap out with fresh runners half way up the beach in order to make the best time. Chicago Park District employees drove two end loaders back and forth through the water to break the ice and keep an open area of water for people to jump into. 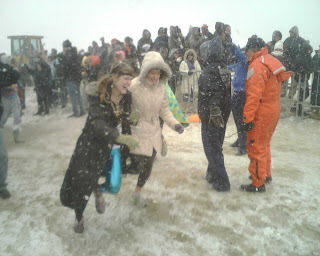 Despite the giant Slurpee consistency of the lake, a playfulness permeated the event. Entrants got creative with the costume contest including a well crewed yellow submarine and a plethora of Vikings and Nuns. 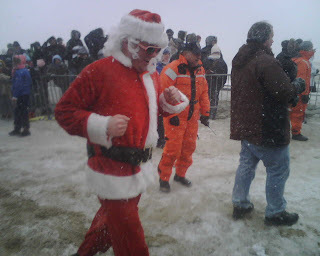 Even Santa in sunglasses and the Statue of Liberty were sighted. That's just mad. Completely mad. Note guy wearing CUBS shirt- no Sox fans. Just saying.